Our Tempris sensor system and components are designed for freeze-drying / lyophilization. Applications are ranging from laboratory FDs to production FDs with API in a sterile environment for real-time product temperature monitoring. All Tempris measurement system components are cGMP, GAMP 5 and FDA 21 CFR Part 11 compliant. Tempris Lyophilization (TL) sensors are available for different vial types and fill volume. You can also get adapters in order to position your sensors in double chamber syringes or in trays. Moreover, you can use these adapters inside closed containers such as Lyoguard® or Lyocup®. Positioning sensors inside the vials is easy. 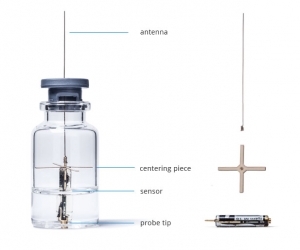 There is a disposable sensor antenna and a centering cross piece that come in a set. Firstly, the antenna feeds through the vial stopper. Secondly, one can adjust the position to hold the sensor at a defined vertical position. The centering cross piece ensures that the sensor is horizontally center-positioned in the vial. Thus ensuring the sensor measuring tip is exactly at the center bottom of the vial. Tempris sensor antenna’s are made of thin and flexible stainless spring steel. Therefore it is smoothly bent rather than destroyed during the process. It also protectects the sensors from damages during the stoppering process. Extensions to the above temperature range down to -70°C and up to +60°C or +70°C are available on request. It is worth noting that Tempris sensor accuracies are not only specified for the complete Tempris measurement system component chain but also over the full temperature range. You can sterilize Tempris sensor for Freeze Drying / Lyophilization with saturated steam and clean them with peracetic acid, hydrogen peroxide, hydrogen peroxide solution, sodium hydroxide solution or isopropyl acohol. Tempris is the world’s only sensor technology that measures product temperature (Tp) in a vial. Moreover you can introduce it in the sterile filling area (Isolator and RABS). Transfer of pre-sterilized sensors via Rapid Transfer Port (RTP) system in the freeze dryer isolator Tempris helps to enhance the effectiveness and reliability of existing freeze-drying technology. Additionally the software offers a loading map to place sensors exact on Hot and Cold Spots inside the chamber. High reliability of data is an important aspect for our clients in lyophilization. Tempris DataServer (TDS) software provides an Automation interface option for connecting the Tempris system to the PLC/SCADA system of your freeze-dryer installation. Tempris Automation option gives you the choice between 4 to 20mA or 0-20mA Current Loop Interface and a Modbus over TCP/IP (Slave or Master) interface.